Sometimes an old classic can be the most fun! 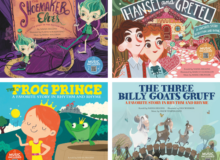 This interactive lesson uses music, readers’ theater, and more to explore the elements of a story such as characters, setting, and major events. Students will enjoy singing along to the classic tunes and then getting creative with their own adaptations. Get STEAMing: art, language arts, and makerspace extension activities are also included! Download or stream the Fairy Tale Tunes songs for free!